The same could not be said exactly two centuries later as a steady stream of rain descended on Hallockville Museum Farm Saturday morning, where a weekend-long event commemorating the 200th anniversary of Defense of the Eagle, the only War of 1812 battle to take place on the North Fork, was being observed. Unfavorable weather conditions ultimately prevented roughly a dozen actors with the 3rd New York Regiment of 1775 Company from reenacting the once-forgotten battle, which took place between American sailors and militiamen and a pair of British warships off the Northville coast, on Saturday. 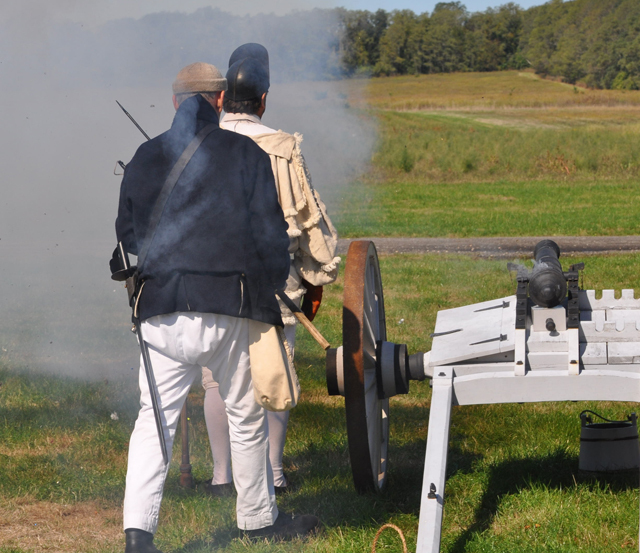 But they rallied on Sunday, entertaining spectators with artillery and firearms demonstrations, a cannon firing, guided tours of a replica 1814 homestead, a discussion of the battle, and, of course, a reenactment of the battle itself. Visitors were also able to tour exhibits about the conflict and view an elaborate diorama Riverhead High School history students built about the Defense of the Eagle. 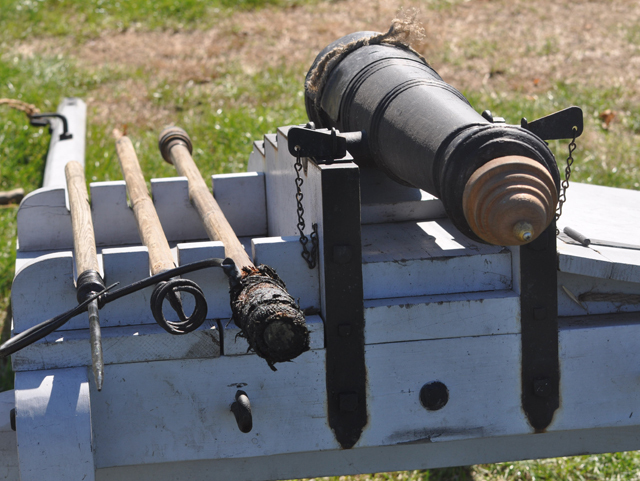 “My basic hope is that we educate visitors and entertain them along the way about the battle and the fact that this is really the only battle of any significant that happened here on the North Fork in most any war since the Revolution,” said Herb Strobel, executive director of Hallockville Museum Farm. Mr. Strobel said the museum felt fortunate to partner with the U.S. Coast Guard, who loaned authentic replica uniforms from the War of 1812 for an exhibit, and the New York Council for the Humanities, which provided a War of 1812 grant to help fund the event. Actor Mark McClane of Southampton, who played a sailor representing the U.S. cutter Eagle on Sunday, said he’s been participating in reenactments for 28 years. Naturally, he enjoys history — but reenactments are largely social events, too, he said. See more photos by clicking on the page links below.